Very few writers in our country have endeavored to focus on the issues related to revenue sector. Despite the fact that this sector is quite important in the context of our country writers have long ignored this topic. However someone has at last shown some courage to write a book on the overall situation of our revenue sector. 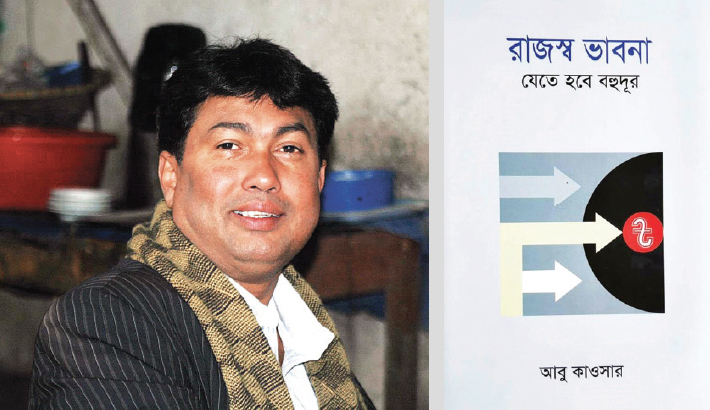 Abu Kawsar, special correspondent of the Bengali daily ‘Shomokal’, has penned a book titled Rajaswa Bhabona: Jete Hobe Bahudur (Thoughts on Revenue Sector: Miles to go) focusing on the revenue collection and management system of Bangladesh. It is the first book of this kind in our country. This book can be considered as a reference book for the people involved in the process related to revenue collection and expenditure. They can study this book as they will get to know a lot of critical things about tax collection process and how the revenue can be managed and spent for the betterment of the country. The fact is that our economic policies are still influenced by the colonial mindset and the writer has very immaculately addressed that issue in this book. It is often said that concerned people do not address many problems and show some kind of reluctance to do so owing to the fact that such scrutiny may reveal their own lapses. It is interesting to observe that even after 47 years of its independence our revenue sector and other economic decisions have not underwent much reform as those policies are still greatly influenced by colonial ideologies. The writer has tried very aptly to reflect on all these delicate issues and raised questions about those lapses in the system in his book. The writer, in various chapters of the book, has pointed to the irregularities in the revenue collection process of our country. Interestingly there is no exact statistics on the total amount of tax evaded every year by influential people. Moreover no qualitative research or study has been conducted with a view to determining the exact amount of unreported income in the name of tax exemption. Due to his professional responsibilities (journalist) Abu Kawsar has been working and reporting on finance and tax administration related topics for a long time. The findings from his close observations and investigative reports regarding the activities of the board of revenue have been reflected in this book. Meanwhile the writer has taken several interviews of some of the former NBR chairmen, members, policymakers and researchers, which have served as an important source of information for his book. However the title of the book itself speaks of the writer’s sincere intent. He could have kept it simple but he has added a sub-title as well (Jete Hobe Bahudur) to put emphasis on the future action plans that should be taken by the concerned people and the Board of Revenue to strengthen the whole revenue collection and expenditure system. To put it in plain words, this book is good enough to enrich the knowledge of the decision-makers working in the revenue sector.